The good form of the Danny O'Brien stable rolled on at Caulfield today and took with it a long priced winner. That winner was Pride of Westbury ($13-$17), a five-year-old son of Octagonal who's endured both a long run of outs and a serious injury. O'Brien's stable foreman Gino Mata said he expected the gelding to improve today, but not necessarily win. "He was entitled for a turn around in his form," Mata said after the race. "He'd been racing into fitness." "He suffered a bowed tendon last time in (work)," he pointed out. "We haven't been able to really do that much with him rather than just let race fitness do its job." "It was good today, he showed so much courage at the finish," he added. 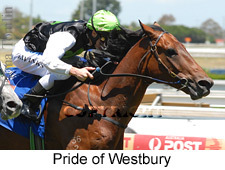 A 16/1 shot with on course bookies, Pride of Westbury started another ten points longer with the local TAB. Pride of Westbury, who'd won just two of his previous 21 starts, had finished behind the placegetters in both his runs this preparation - a seventh at Kyneton and an eighth at Moonee Valley under the lights. "It was a nice surprise," winning rider James Winks said. The win continues the powerful run for both O'Brien and Winks - who during the spring carnival combined for a stakes win and a Caulfield Cup placing with tough stayer Douro Valley. 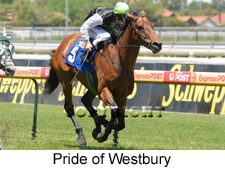 Pride of Westbury's most recent win came in a Class Four event over 2200 metres at Seymour on October 22 last year. His only other victory came in a maiden over the same distance at Sale in April earlier that year. 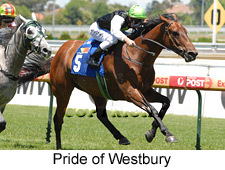 At the line today Pride of Westbury ($13-$17) held a half neck margin over the favourite Attrition ($3-$3.30-$3.20 fav). Speedymac ($3.20-$4) was another length and a quarter back in third place. Pride of Westbury will now get give his chance in "Saturday city class" according to Mata.